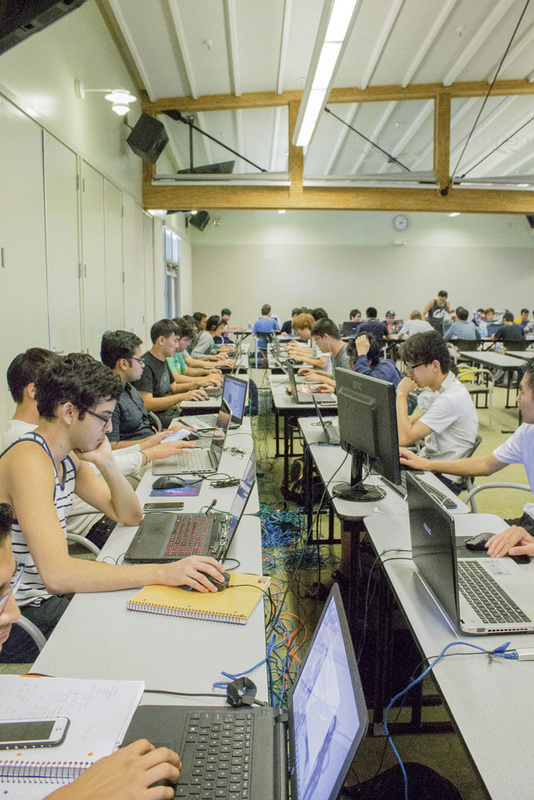 Gamers from Santa Barbara, San Luis Obispo, Irvine, and other Southern California colleges gathered in the Loma Peloma Center Saturday to compete for glory and prizes at UCSB’s Fall LAN event. Students lugged entire computer setups to LPC, taking Ubers and carpooling from the far reaches of Isla Vista to get their equipment to the event. Some had built their desktop computers from scratch, getting optimal hardware for better gaming. Participants switched from room to room, munching on snacks and exclaiming over games of “League of Legends,” “Hearthstone,” and “Overwatch,” to point out a few. Named for the “party” that happens when online gamers connect on the same internet network to play, over 200 people showed up for the 12-hour event, to the UCSB eSports Club’s delight. According to statistics from Albert Chen, one of the event’s organizers, “Super Smash Bros. Melee” was the most popular game, drawing 91 participants. “League of Legends” and “Super Smash Bros. for Wii U” drew the second and third most people at 50 and 48 participants respectively. Seeing 250 people in a room, hanging out, and playing popular video games may not be what comes to mind when someone says “gamer culture.” The $23.5 billion video game industry is also churning out education, careers, and micro-celebrities in the business. The figure is even higher according to UC Irvine figures, which say that revenue could approach $1 billion by 2020. Although UCSB is known for its academic success and research output, what drew a few well-known gamers to campus on Saturday was the opportunity to compete and have fun. McCain LaVelle, known in Melee circles as “MacD,” made an appearance among other Smash players to hang out. LaVelle has been playing Smash for nearly 10 years by this point, and has ascended to 15th on a 2015 list from Melee Rankings. LaVelle spoke to The Bottom Line at the event about his love for the competitive game. Winning prestige is important to some, but for others who were interested in the event, walking away with goodies also helped. The LAN event also featured a major giveaway, with funding and prizes sponsored by Associated Students Finance & Business Committee, Tespa (a Blizzard Entertainment collegiate gaming organization), and Dreamleague Gaming. Some prizes also came from Razer, a gaming company that hosted an event a few week prior on UCSB’s campus. Chen said that 30 people received big prizes at the event like Hearthstone pillows and Razer headsets. In total, almost $1,000 was given away in prizes. LAN parties are a hallmark of collegiate gaming organizations, both as a bonding event for gamers to meet people with the same interests as them and as a way to present their club’s mission to the greater population. League of Legends and Smash clubs on campus have hosted some in recent years, drawing Central Coast gamers. The event grew by word-of-mouth: many of the organizers invited friends in-person, but for gaming teams around Southern California, Facebook event advertisements drew them to campus. For friends who just stopped by, there were still options for those who had no experience or computers. Tabletop games like Settlers of Catan were laid out for groups to try out. “We also came last year and just really enjoyed it, even though we didn’t win,” said Travis Cramer, a fourth year math major. Like Cramer, many other students have played at UCSB gaming events before, both for the privilege of saying that they had won competitions and to experience an enjoyable pastime. UCSB isn’t quite the hub for eSports that some of its university counterparts are. Students realize this, but are working to build a sense of community around gaming on campus. “At the moment, eSports on campus isn’t as big as other UC campuses, so to have even like 100 people show up is pretty cool,” said Josue Ortega, a fourth year political science major. UC San Diego has major Smash tournaments ever so often, and UC Irvine just opened an on-campus eSports arena and webcasting studio to stream games. UCI also announced that they would form a competitive gaming team and offer scholarships to talented players back in the spring. Gwendolyn Wu and Rebecca Lauffenburger contributed to this article.